That morning I had met Russ in the Park Tavern, a cosy traditional pub which beneficially sits immediately opposite Priory Park, a stone’s throw from where the wedding ceremony was to take place. He looked smart and distinguished, dressed in military Warrant Officer’s uniform and seemed composed and collected in the company of his best man. After a few pre-wedding pictures in the pub I popped over the road to have a sneaky peak at the dressed interior of the Guildhall. Stepping into the quiet, light-filled space, I noted delicate pink wax flowers on the pew ends and dark jade green organza bows decorating the backs of the chairs. 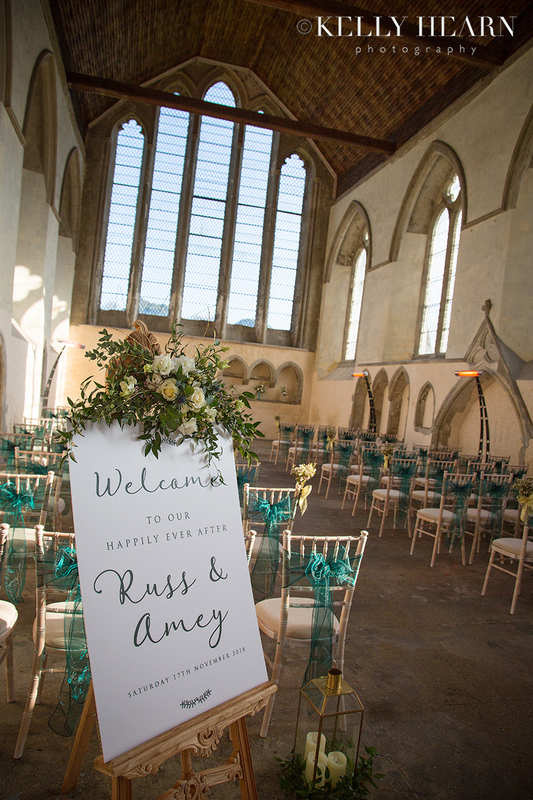 An elegantly designed welcome board to greet guests was fitting with an order of service booklet and paper cut hearts hand-prepared by Amey. Amey and her two bridesmaids meanwhile, were getting wedding-ready in a private cottage at the reception venue of the stunning Harbour Hotel. With it’s close proximity to the Guildhall, the couple had chosen this Grade II listed boutique property in keeping with the classic and history-filled theme of the day, with Amey even benefitting from a view to the wedding venue from her bedroom window! Instead of donning the recently trending floral kimono gowns, I loved that the girls had sensibly opted for cosy PJs and fluffy socks as their choice of getting-ready attire. 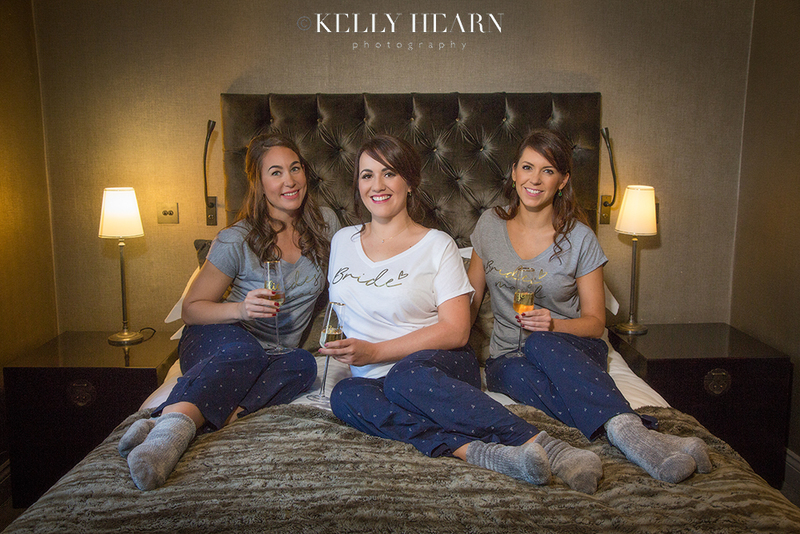 Having had hair and makeup professionally done by Charlotte from Polka Dot, they happily sipped champagne in total comfort before slipping on their gowns. Getting into a wedding dress is always a two-person job. Thankfully Amey’s Mum was on hand to assist in the bridal gown fitting and fastening, along with the delicate art of train-arranging. 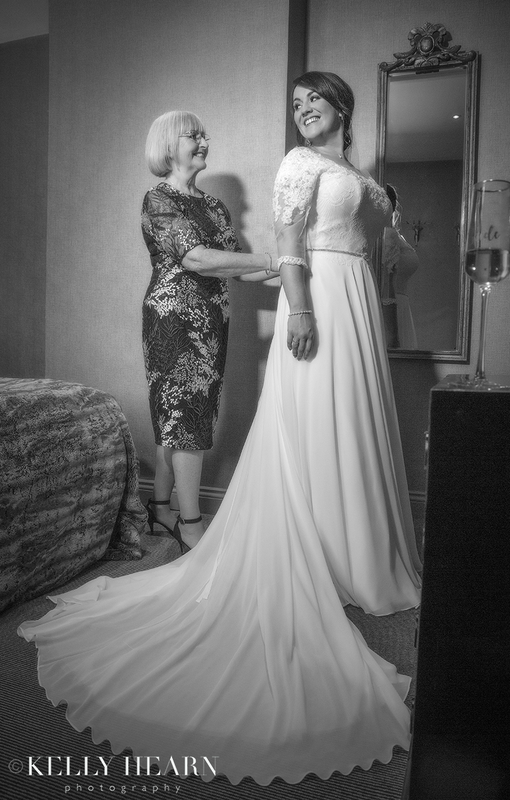 The soft fabric with it’s fine scalloped edge fell beautifully, ensuring this bride was a picture of sophistication and elegance. Pretty lace ornamented the neckline and sleeves, whilst a flattering belt accentuated the waistline and the luxurious overlay of the skirt hung gracefully to the floor. 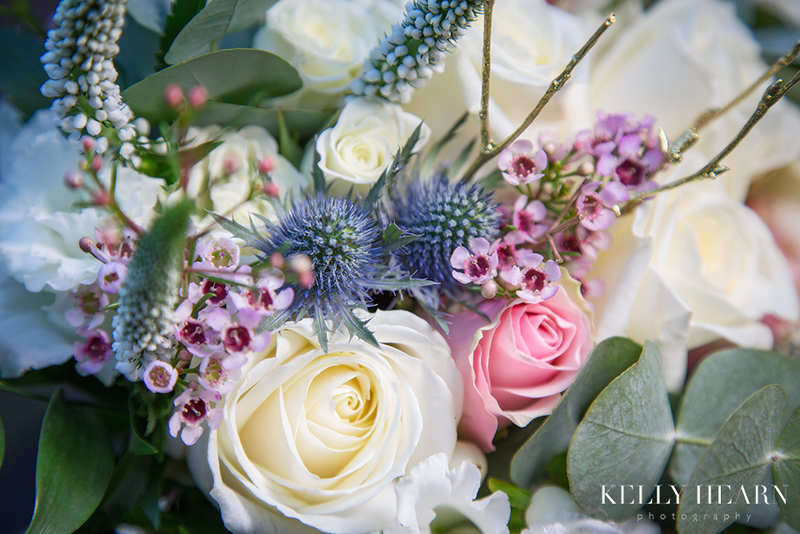 Amey’s bouquet designed and created by Earth Seed to Bloom combined white and pink roses, the pastels of wax flowers and also subtle blues from occasional thistles dotted throughout. Sage coloured eucalyptus leaves brought the modern tear-drop bouquet together, teaming perfectly with Amey’s classically styled gown. 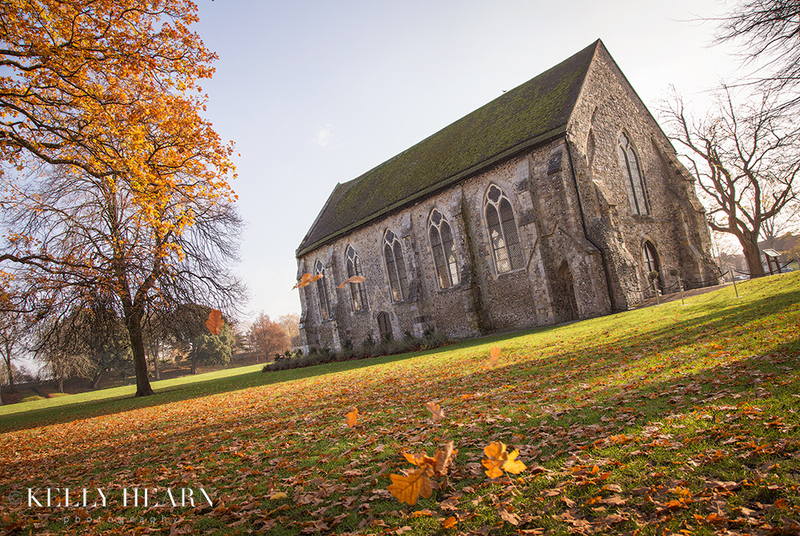 It was time to make the short journey, by foot, from the Harbour Hotel across the park to the Guildhall. Warmed by the winter sun streaming through the trees, Amey, arm-in-arm with her beloved Dad, followed the path towards the arched doorway. 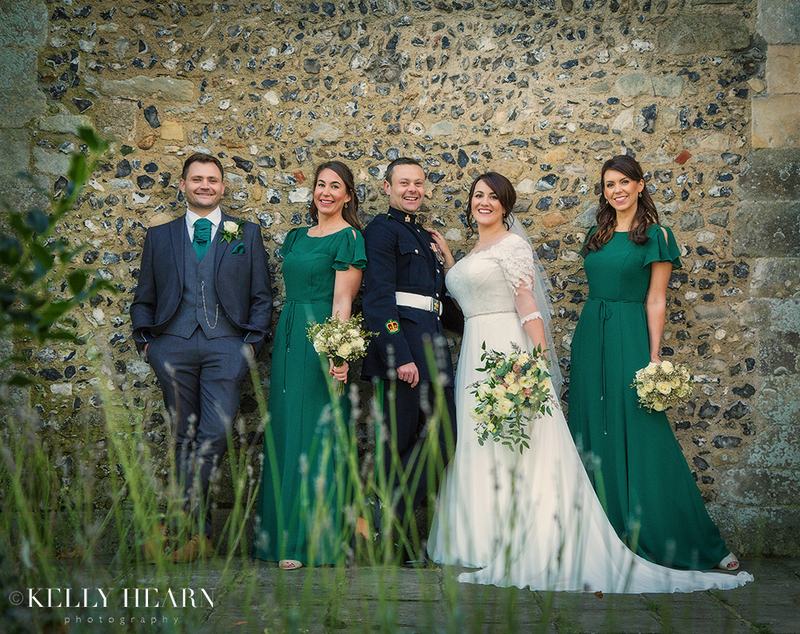 Leading the way were her two bridesmaids who wore emerald green to tie in with Russ's green stripe featured in his military dress. 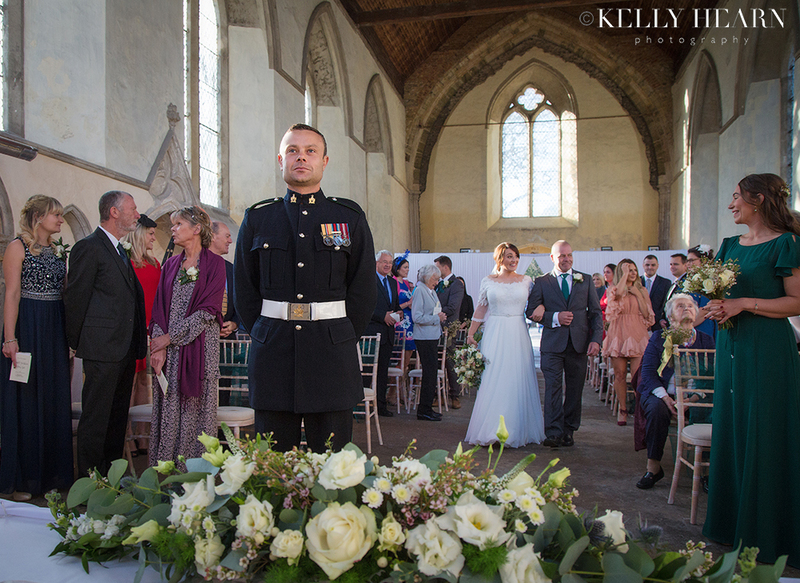 During an emotion-filled entrance, patiently waiting at the end of the aisle was groom Russ, who turned in delight to see the arrival of his beautiful bride. 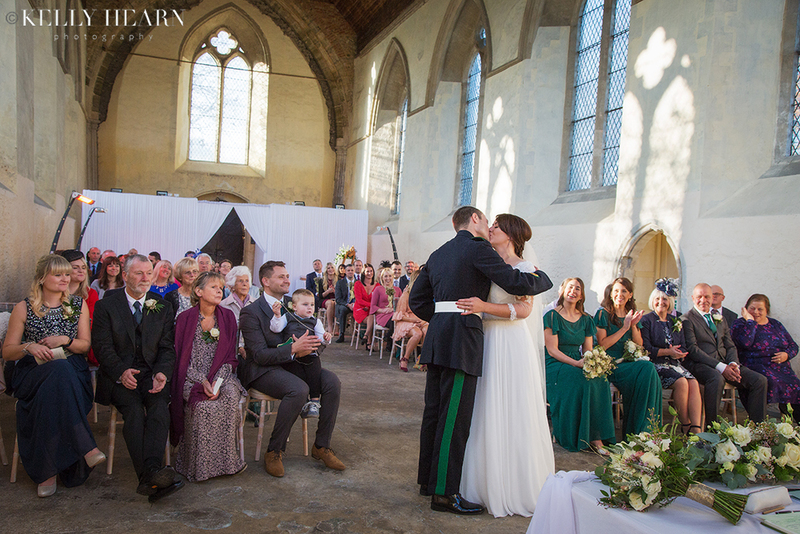 With a room full of sunlight and smiles, friends and family cheered as the couple completed their nuptials and embraced for that first kiss as husband and wife. 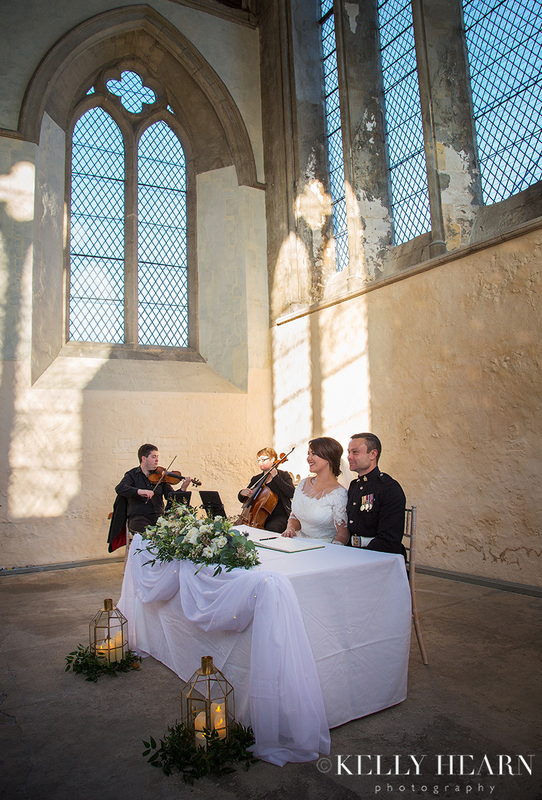 As the sun continued to stream through the vast windows and with the blue chilled sky outside, the couple signed the register to the live soothing strings of cellist and violinist duo - Chapel Hill from Toast Functions. 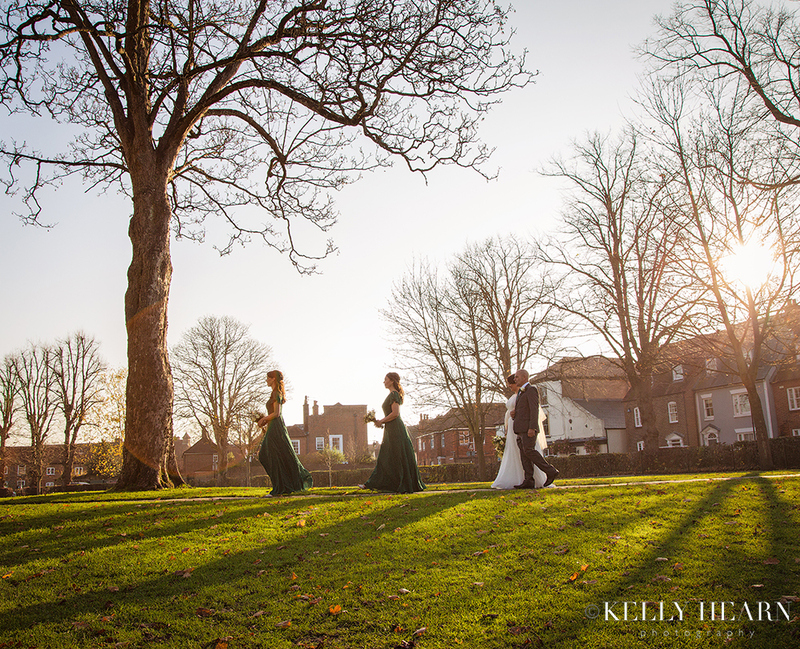 Keeping things classical was a theme that was proving both successful and seamless on this wedding day. 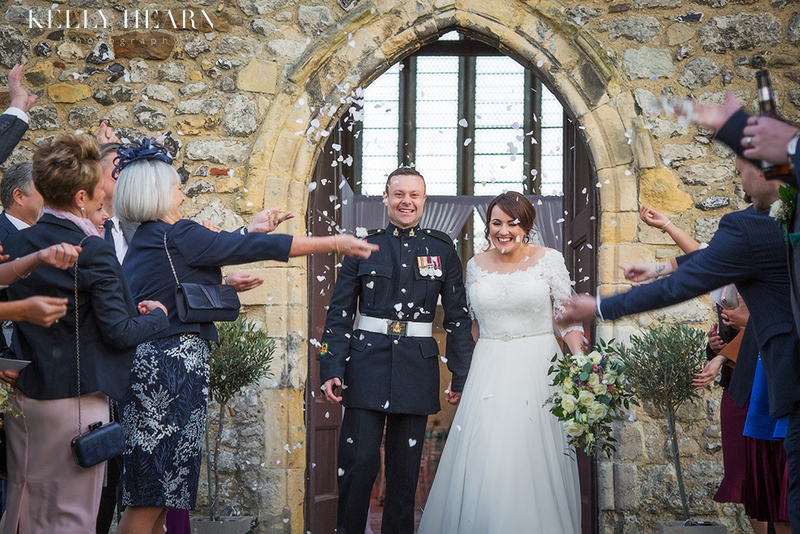 As per tradition, the new Mr and Mrs were greeted by joyful guests and showered with confetti as they exited through the chancel arch. 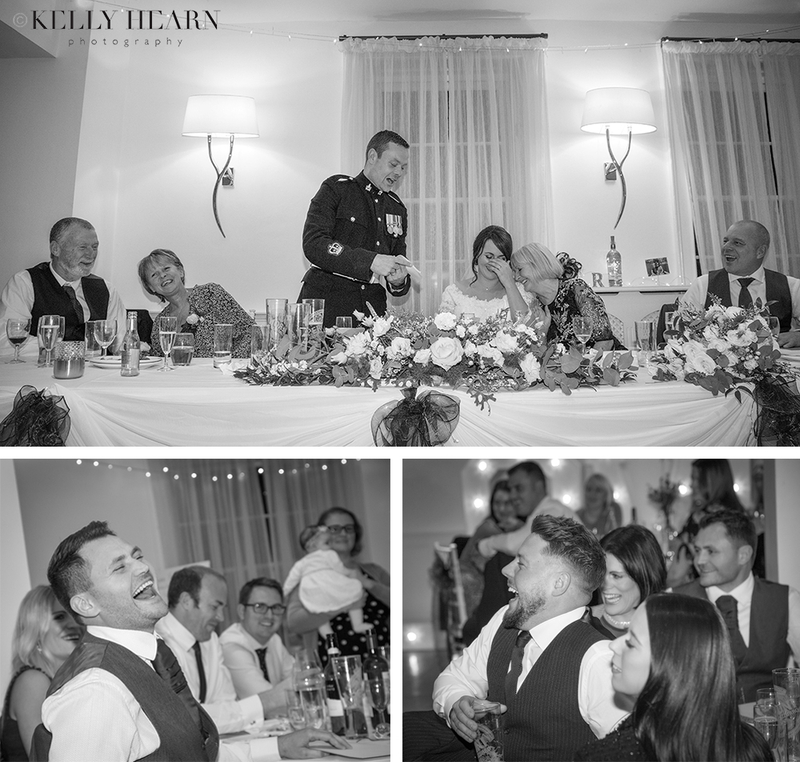 Guests enjoyed a glass of bubbly and a chance to mingle inside the foyer of the venue whilst the bridal party ventured into the outside space for some photographs. 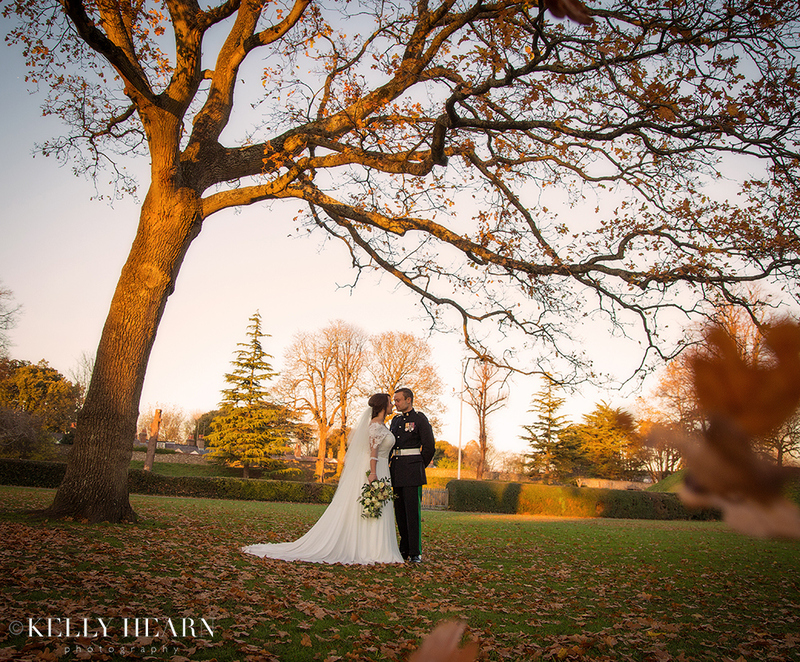 Providing a host of textures and colors, the traditional Sussex flint-stone walls of the extraordinary architecture and the glowing leafy expanse of the surrounding park, made for stunning backdrops to the images. With a spectacular canvas made up of a thousand shades of oranges, yellows and greens, Amey and Russ stood framed amongst the vibrancy of the scenery and twiggy outlines of trees in these memorable and romantic portraits. Back at the Harbour Hotel the room was laid out ready for guests to arrive. Glittering golden table runners, mirrored tealight holders and centrepiece stands glistened, as fairy lights and candle flames reflected and shimmered amongst the settings of silver and glassware.The little wax flowers featured again, decorating the pretty cupcakes which cascaded beneath a lovely traditional top tier wedding cake created by Tracy at T Cakes. Posies of flowers sat arranged in gin bottle vases, whilst the room plan (created by Plain Sage Designs) complimented the previously seen stationery and ensured a different brand of gin & matching card had been assigned to each table. An exquisite wedding breakfast followed by hilarious speeches had guests in giggles which was a great warm up for the evening party ahead. As guests hit the dancefloor, Toast DJ Doug provided an awesome 90’s set which ensured guests fully luxuriated in a bit of teenage nostalgia! 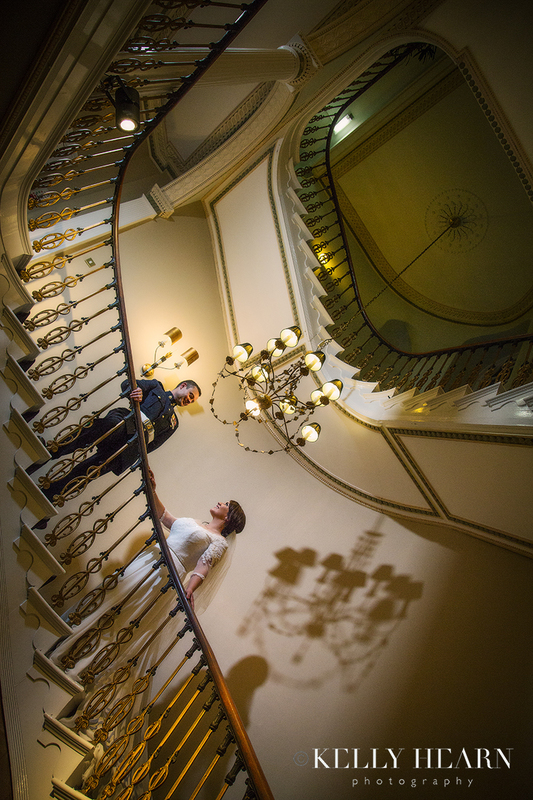 I stole the newly-weds away briefly to capture them amidst the beautiful Georgian details of the hotel before putting the camera down, enabling the bride and groom to let their hair down for the evening, but also so I could bust a move or two to tunes from my favourite musical era! 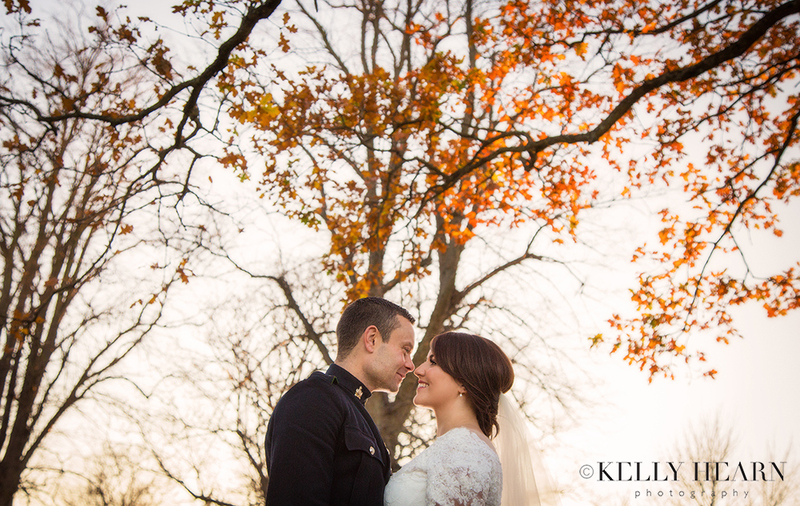 It had been a idyllic day full of breathtaking backdrops, charming venues, classy outfits and delicate details. Each choice had been so cleverly timeless and my lasting memory will always be of the fun and laughter we’d all enjoyed! 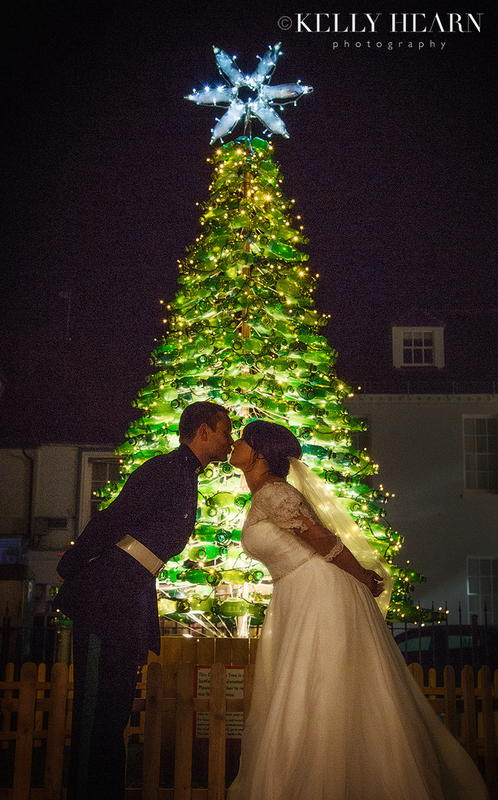 One fun moment captured shows Amey and Russ getting festive in front of Chichester’s tree with a difference (which we rather liked!) - a tree made from recycled bottles! 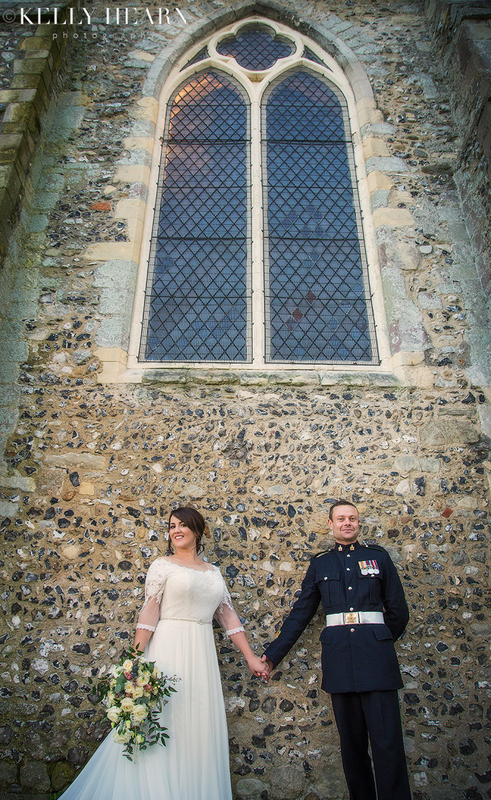 We really had enjoyed the sights of Chichester that day! Thanks Amey and Russ for allowing me the honour of capturing your special day, it really was a pleasure and one I enjoyed so much. I wish you both all the happiness in the world and for many years to come.